Fitness and the “internet of things” go hand in hand. Today there are hundreds of devices with sensors and monitors that interact with your smartphone to give you the data you need on just about everything. We’ve tested devices here at nibletz world headquarters that monitor everything from temperature, to humidity, to steps walked to chlorine levels in a pool. Yes everything has a sensor. The biggest segment here is of course fitness. Fitbit, Fuelband and other devices allow users to have their workouts monitored and the info tracked on the smartphone. Well if you’ve decided to tether fitbit to your dog’s collar either to make it look like you’re working out more or you’re curious what kind of workout Rover is getting while you are at work, you can stop now. Thanks to the brother and sister team of Davide and Sara Rossi, there is now Fitbark. As you may have gathered, Fitbark is one of those “internet of things” devies that allows you to monitor the energy level and things that your dog does. You may want to make sure that after that steak you fed him last night, he is sweatin to the oldies while you’re dropping the kids off at school. Fitbark has some great real life uses that most dog owners would actually consider, before buying the device. For instance, you want to know that your dog actually went for a walk while he was at the boarding facility or while you were paying the neighbor to “dog sit”. You could tell by the level of activity whether your dog sat around all weekend or if he had his walk. You can also tell by the data sent from the Fitbark to the smartphone app, whether or not your dog was walked at the proper times. If the pet sitter says she walked him at 4:30pm but you see he was sleeping, blasphemy, caught in a lie! Fitbark is also a great way to monitor your dogs health. After all dogs can’t really talk. You may notice in the monitoring of your dog that he or she goes a few days with a lot less activity, that’s probably an indicator that something is just not right. For those folks out there that are parents, and only to the canine species, a device like Fitbark may be just what the doctor, I mean veteranarian ordered. You can support Fitbark on Kickstarter and hopefully be one of the first people to get one. Check out our video interview with Davide Rossi below. 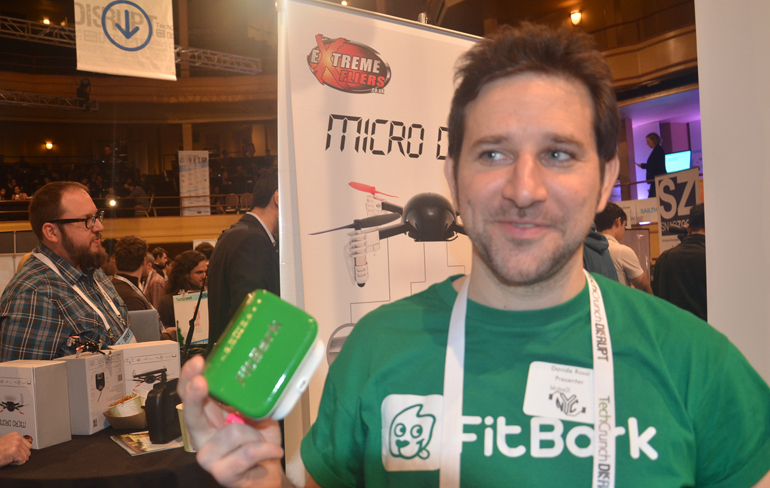 And here are over 50 more startup stories from TechCrunch Disrupt NY 2013. Pingback: Dallas Startup Be Pawsitive, Buy One Give One For Dogs!